The Health Clinic, located in Graiguenamanagh, Co Kilkenny is so far providing the only termination services in the adjoining counties of Carlow and Kilkenny. 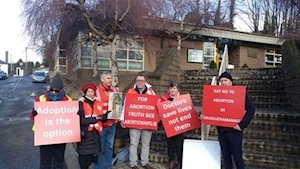 The group were holding signs with slogans like “Say no to Abortion in Graiguenamanagh” and “Doctors save lives not end them”. It comes as legislation creating exclusion zones around healthcare facilities providing abortion is expected to be ready by March. One mother who did not wish to be named said: “It’s absolutely despicable to have protesters frightening children and causing distressing scenes. The sooner the better these exclusion zones are introduced the better. The clinic, which has two GPs working there, received several nuisance calls last month, which caused upset to staff, by those opposed to providing the abortions pills. Gardaí continue to investigate the phone-calls made to the clinic. It is believed that ongoing issues in setting up the service in St Luke’s General Hospital in Kilkenny are delaying the implementation of abortion services to the wider areas of Carlow, Kilkenny, Tipperary and Laois. More than 600,000 people live in the south-east of the country. The latest picket is the fourth known protest since termination services became legal in the State. The first occurred just three days after New Year’s Day in Galway and in Drogheda, Co Louth. Of the 3,500 GPs in the country, just 10% have signed up to providing the services. A third of GPs in Ireland are women. The protests have sparked renewed calls for the introduction of exclusion zones to prevent women seeking terminations from facing protests when accessing services. Minister for Health Simon Harris has promised to introduce legislation for such zones. The legislation which makes abortion services legal in Ireland was signed into law at the end of December by President Michael D Higgins after passing through all stages of the Oireachtas. The Health (Regulation of Termination of Pregnancy) Act allows for terminations of pregnancy of up to 12 weeks, also providing for terminations where there is a risk to the life or a serious risk to the health of the pregnant woman. GPs provide the service up to nine weeks of a pregnancy, after that time a woman will be referred to a hospital for the other three remaining weeks. In response, a Kilkenny pro-choice group, Kilkenny for Choice issued a statement saying, “Pregnant people need support and privacy, not intimidation and harassment. (We need) safe zones now.